How the Hell Do You Guys Do It All? « Who Needs a Pension When You Have Real Estate Investments? We totally get it – as entrepreneurs and parents to two young children, it often seems like there aren’t enough hours in the day to handle everything. Entrepreneurs usually have two speeds: go, and go faster – but this can lead to burnout, which can negatively affect both your personal and professional life. Our secret to doing everything while still managing to enjoy family time and take vacations? The only way we can maintain our sanity is by sticking to a schedule and a system – and we’ll show you how we do it, so you can learn to make your work/life balance easier as well. 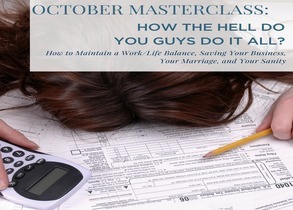 At this master class, we’ll show you an inside look into our lives and the systems we’ve developed to manage it all. With organized schedules and systematic habits, your life will get a heck of a lot easier and you’ll find yourself being able to relax much more often. You’ll walk away with the skills you need to live a happier life outside of work hours, and be more productive in your business.